"In heaven, single file, only one door!" The week before Pentecost in Brazil is the week of prayer for Christian Unity. On this occasion we decided to go out to pray “outside the walls”. 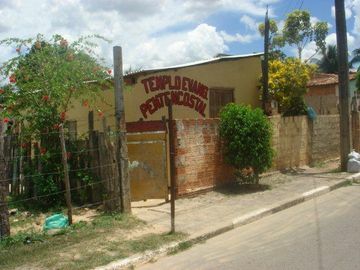 The thought process was rather unique: in the reality of the North East of Brazil ecumenism is quasi non-existent, all the more so now that the new Pentecostal churches forbid their faithful to enter a Catholic church. In this context of tensions between Christians and even competition between churches, we went, as humble pilgrims, from one place to another. 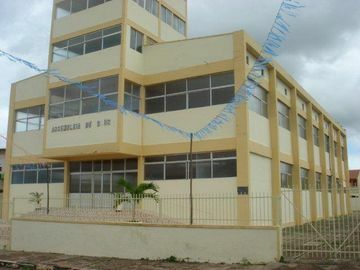 The first visit was to a candomblé place of worship. This religion of African origin has kept going until the present day by concealing itself, since the time of slavery, within the worship of saints. The heady rhythm of percussion. Precisely choreographed dances. The Pai do Santo, the father of the Saint, who is officiating this evening invokes Lemanjá, goddess of the sea. This Saturday two young women are making their “obligation”, the first vow of their initiation. After the break and a good plate of feijão, the red bean stew which is the main daily meal in the north east, Lemanjá appears in the form of the Pai do Santo who, now dressed in feminine clothes, dances alone from now on and comes to greet, embrace and bless each of those present. The second visit was dedicated to one of the numerous city-centre Baptist churches, the Church of Bethlehem (charismatic Baptists). The congregation seems to be mostly middle class: there are cars around the church. Inside, a warm welcome for those who are here for the first time. The praise is led by a small trio, guitar, bass, drum kit. A Powerpoint display encourages people to sing and to enter into this strongly powerful music. It’s lively, then calms down for the long sermon on the theme of calling: as with Gideon and Moses, God says to us: “you can”. We are invited to turn towards our neighbours to say to them, in our turn, “you can!” The people do this seriously. Once the service is over, discussions continue on the square in front of the church over a glass of corn balls cooked in coconut milk. It’s good, sugary and warm, just like the celebration. The pilgrimage proceeded two days later at the Assembly of God, a Pentecostal church close to the house. A tiled floor, some mauve material which matches the dress of Maria the deaconess, thirty or so plastic chairs, a small combo for the sound, an atabac – a long drum in skin – to beat out the rhythm. In the absence of a pastor, it is two women who lead the praise. The people take turns to sing into the microphone: mothers and children come to praise God and sing astonishingly well. We are invited to say a few words which, in 25 years in the neighbourhood, has never happened to us before in a Pentecostal church. One of us speaks of Luke 3: “God says to each one of us: you are my beloved son, my beloved daughter” and starts a song with the same words. The whole assembly takes up the song. When the praise finishes, Isabela, the oldest woman of the assembly, comments in this Portuguese so typical of the neighbourhood on the text of Zachariah. The assembly approves of her phrases with loud acclamations: Glory to God! Praised be God, Amen! At the end of the service, Isabela lines us up, one behind the other, and she tells us: “In heaven, single file. No matter where you come from, no matter what your church. In heaven, single file, only one door!” What more can one say? Then next day, a visit to another little Pentecostal church on our street. On the façade of this garage transformed into a church, the name of the assembly is written in large letters: Flame of fire. What a programme! We arrive after our evening prayer and, on the way in, we greet a young adult, an ex-addict who is well known to the brothers and who has the reputation of having already killed someone. The contrast is striking between our meditative chants, which we left behind only a few minutes before, and the deafening racket of this little universe of steel. No melody instruments: just a drum kit and several other percussion instruments. The lady pastor yells her very moralising sermon about drugs and prostitution. Then comes the time for cures and other exorcisms. The twenty or so people who have gathered shout with her: “out, out, out” over the head of the gipsy woman lying on her back. A second and then a third person “falls” next to her. The noise, the elation bring to mind certain aspects of the candomblé. These tiny little churches seem to speak to the depths of the African soul. The poor are there and use there a surprising and rather disconcerting vital energy in the spiritual combat against the forces of death which surround them. At the end of this week, a visit to the central church of the Assembly of God. This Sunday they were celebrating the 100 years since the arrival of Swedish missionaries who exported this church of Awakening as far as Brazil. There we met the missionary Marcos again. A child known to the brothers, catechised and baptized with them, then become a gang leader and drug trafficker, he found Jesus after receiving two bullets in his side (scars bear witness and were shown when he told of his conversion during our first meeting). At the hospital, he prayed to receive grace, and met this in the person of…Grâce whom he has just married. 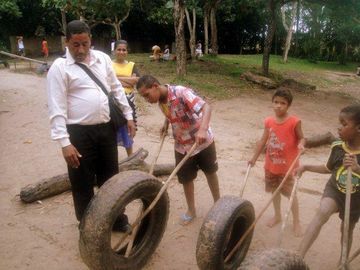 He now works as a missionary and leads addicts to the Dr. Jésus foundation, the work of an evangelical pastor who offers 9 months of recovery for crack addicts and alcoholics. After the service, he takes us to his home, in the first council housing of the town built by the programme “my house, my life” one of the emblems of the politics of the ex-president Lula. He proudly shows us his certificate of ‘conqueror’, framed and hung on the wall; this was signed by the pastor when he completed his detox treatment. It is agreed that tomorrow he will take one of the alcoholic boys, from a family known to us, to the treatment centre. Before leaving to warn the family to be ready on the next day, we end with a prayer in the middle of his lounge: “God, you protect and guide us. We entrust to you our families and our work, in the footsteps of Jesus”. In an apartment which is overheated due to poor insulation, a little deafened by the numerous firecrackers of the feast of St Antony which are exploding in the street, and the poor variety show which is on the television, there we are back together in the service of the poorest who have fallen into the nightmare of addictions. In heaven, single file: only one door!